Polytunnel covers are no longer just something to keep the rain out and keep the temperature a bit warmer in winter. They should really be called spectrum filters which help you grow a much better plant. In the graph to the left, there are 3 lines. 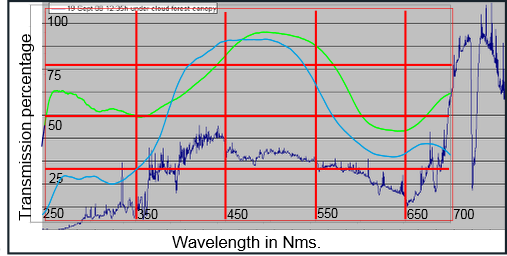 The dark blue jagged line is the actual light spectrum recorded under a forest canopy on a cloudy day. The green line shows the spectral transmission of a SunMaster SmartGreen. The blue line shows the spectral transmission of a SunMaster SmartBlue. You can see that both of them have a curve which more closely matches the curve of the full spectrum films which match the spectrum of a full sun savannah or mountain. ALL plants grow better in the correct spectrum of light.